Asalaamu ‘alaikum sisters! With another year coming to a close, it is natural for us to be entering a stage of reflection. You may already be taking stock of how this year went by. Are you noticing what you didn’t achieve? Are you noticing what got left behind? Perhaps you are aiming to fill some of those gaps in by the end of the year. This time of year can be very tricky. We may be finding ourselves either quite motivated to see things through or perhaps feeling a little bit disheartened or disempowered. What we may have achieved (or not) will have a lot to do with how we are feeling about our lives and, indeed, ourselves. Of course, in life, there are many considerations. Events that are beyond our control, our health and what happens with the effort we put in. There are so many variables and I imagine that you think about a lot of them. However, one variable that indeed has a lot to do with how we end up experiencing life is often left unexplored – that is the variable of language; how we speak to ourselves. How we speak to ourselves is a measure of how we are treating ourselves and how we perceive the self and everything in our life. Our language impacts our results as well. Let’s understand this through an example. I’ve known Nasreen as a personal acquaintance for a very long time. Her language has an interesting pattern. Each time we speak, I notice that she uses words like “terrible” or “not too good” when I ask her about how life is going. She also compares herself with all her friends and feels that she doesn’t do as well or look as good. She complains about having to go out to social events because of her husband, yet she insists on going even though she doesn’t enjoy them. The results in Nasreen’s life are a reflection of her language. She isn’t enjoying life, her health is poor and her relationship with her spouse is suffering. Her focus is on what is wrong in her life; she hardly notices anything that is going well. This has become a habit for her. Nasreen doesn’t realise that she is disempowering herself through the language she uses. For example, if you keep telling yourself that something is difficult, then your experience of it will be that it is difficult. Instead, if you begin to tell yourself that you are taking things in your stride, then things will become easier. The mind works like a filter. Information comes in from various sources and it is our mind’s job to filter information out, according to our own unique beliefs, values, culture and preferences. Another way to understand this is to imagine a coffee or water filter. Essentially, what you get is a filtered version of the same product at the other end. So, if we bring negativity into our minds to begin with, what we will get is something that has a disempowering quality at the other end. However, the opposite is also true. We can train ourselves to bring more productivity in to begin with, so that we feel further empowered and inspired to create more fulfilling lives. Let’s look at a couple of ways in which we can begin to do this. Having an internal voice is something we all share. What separates the empowered from the disempowered is the quality of our internal dialogue. The good news is that we can shift this quality with practice. The first step, however, is awareness. Most of us aren’t aware of how we speak to ourselves, yet it is fundamentally important in shaping the quality of our life. So, if you find that you are not as productive, as inspired or even as positive as you would like to be, then now is the time to really figure out how it is that you are speaking to yourself. This is a slightly challenging process, but not impossible. Get yourself a notebook that you can keep with yourself all the time. Over a period of 3 days, take time out at various points of the day to write in your book. Each time you find yourself thinking about something, just write down the thoughts that come to you. Remember, don’t censor anything, just let your thoughts flow on paper and don’t read what you have written. Just let it be. The next step is the challenging one. I suggest that you find someone who you trust to help you with this. Have this person (or yourself if you really don’t want to share) go over what you have written over the days. Ask them to highlight any thoughts that may seem a little bit negative or disempowering to you. Ask them to look at it objectively, just to notice the words, without judgement. Then ask them to share what they picked out. Have a look at the highlighted thoughts and reflect. On a scale from 1-10, how productive are they? Do you wish to make a change in the way you speak to yourself? If so, now is the time. So now that you know the quality of your internal dialogue, the next step is to begin adjusting it. One useful way is to start replacing disempowering thought with productive thought. One way that people can do this is through using affirmations. An affirmation is a statement that is meant to make you feel empowered. The idea is that it comes from you and is repeated often. If an affirmation is effective and well chosen, it can become a powerful belief over time. Take a few moments to reflect on what you learnt about your own self-talk. Focus on the areas that come through. Is it about your own self, your family life, your work? Once you have narrowed down the areas, then brainstorm two or three affirmations for each area. Once you have come up with a few statements, write them down. Next, go back and make sure that these statements are not the opposite of what you thought before. An opposite will just set up a conflict and that is not what you want. So, for example if you currently think that you aren’t pretty enough, saying, “I am pretty” as an affirmation will just cause internal conflict. Instead, focus in on one quality you like about yourself and create an affirmation around that. For example: “I am thoughtful and courteous to people around me.” Anything that you feel good about can be used to shift how you perceive things. Once you have two or three affirmations that you are happy with, and then write them down in places where you can see them, and repeat them a few times a day. Do not attempt to focus in on more than 3 at a time. As you repeat each affirmation, close your eyes and focus in on the feeling that the statement brings. Visualise yourself living this statement. Notice how good it feels. If you don’t find yourself feeling empowered or happy, then adjust the statement. Remember, these will become beliefs over time so they need to work for you. Keeping a physical track of how you’re doing is useful, isn’t it? One way of doing this is to keep an awareness jar. 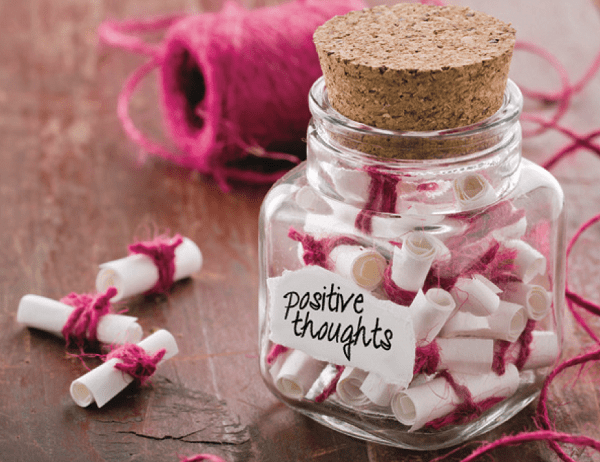 This will be an empty jar where you will deposit some money each time you find yourself thinking or speaking in a disempowering way. You can choose what to do with the funds (e.g. give them to charity). You may find that at the beginning you may be making a lot of deposits; however, as your awareness grows, your attitude and negative dialogue will begin to shift. Work with this in conjunction with the other two steps and you will find small changes taking shape, In sha Allah. Taking charge of how we treat ourselves is a challenging but rewarding process. Our language is one aspect, but a very powerful one to focus on. I hope that you will find these strategies useful. Remember to keep going until you get to the dialogue you want to have. In sha Allah, you will succeed and feel empowered to achieve a life you truly love. This article originally appeared in Issue #51 of SISTERS Magazine, the international magazine for fabulous Muslim women co-founded and edited by Na’ima B. Robert, author of From My Sisters’ Lips.